Sensient® Colors, a division of Sensient Technologies (NYSE:SXT), today announced a major advancement in natural color performance. For many years, food manufacturers have been frustrated by the absence of a truly heat stable natural red color for neutral pH baking and dry grocery products. Sensient’s new SupraRed™, using a novel natural color technology, will enable brands to deliver on growing consumer demand for natural colors from botanical sources that do not sacrifice on color brightness. “Closing the gap between synthetic FD&C colors and those from natural sources is a key strategic priority at Sensient. We are committed to providing food and beverage manufacturers with solutions that allow them to complete their conversions to natural colors without having to compromise,” stated Michael Geraghty, President of Sensient Colors LLC. Baked goods and many dry grocery food products are typically in the 5-7 pH range while the heat step in the production process can further raise this level. The increase causes red anthocyanin color source to shift to a purple shade. Beet would be ideal, but is prone to browning during heat processing. SupraRed™ vegetable juice provides previously unachievable heat stability. 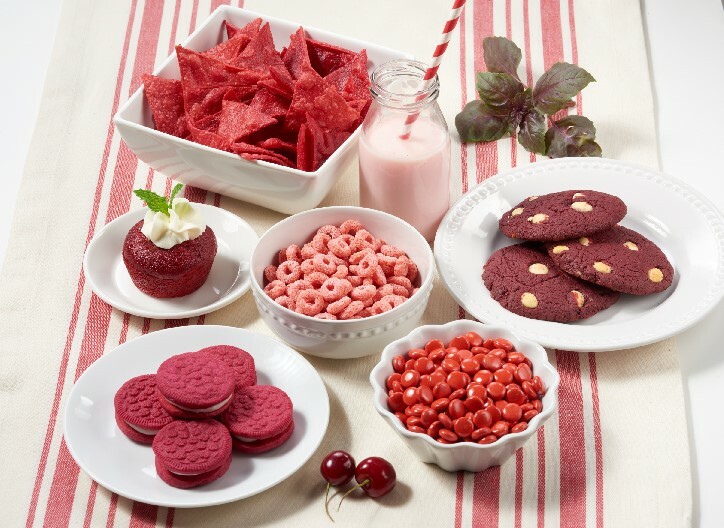 “This technical breakthrough in natural color technology means food manufacturers can provide consumers with the bold red velvet baked goods and bright red cereals that they have come to expect. Additionally, because SupraRed™ typically requires a lower usage rate, it can reduce cost-in-use and provides other unique advantages,” explained David Gebhardt, Technical Director of Sensient Food Colors. The novel technology SupraRed™ employs is free from any chemical solvents and uses only vegetable juice for simple ingredient labeling. Ideal applications include baked goods such as cookies, crackers, and cakes, as well as ready-to-eat cereals, tortilla chips and other dry grocery products. Additionally, SupraRed™ offers significant advantages for dairy applications such as UHT packaged beverages and confections like licorice. Sensient Colors brings life to products, adding color and visual enjoyment to food and beverage applications worldwide. Offering unparalleled color innovation and proprietary technologies, Sensient Food Colors applies industry defining color expertise, enhancing brand value through premium sensory appeal and performance. Sensient Colors, LLC is located in St. Louis, Missouri.